by PaulEMoz in "Cave", "Deathsmiles", "DoDonPachi Resurrection", "Rising Star Games", "bullet hell", "shmup"
Oh boy, here we go again. Let the Japanese bullet hell madness recommence! Rising Star Games are sticking their necks out for us European gamers, and are publishing some very niche titles from the country that specialises in niche titles - Japan. Last year, they published My number two game of 2010, Deadly Premonition. At the beginning of this year, they published a game I enjoyed very much, Deathsmiles. And now they've mined that very same vein, and published another Cave shooter... DoDonPachi Resurrection. Awwww, look... an easy one. How nice. I'll be honest... 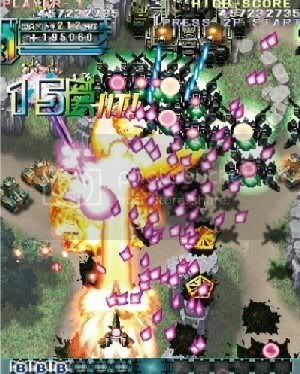 I was never a great fan of the DoDonPachi series of arcade games. I'm a simple man at heart, and I enjoy just flying up the screen, blasting whatever is in my way. DoDonPachi relies on chaining for the best scores, and I could never get the hang of it. It's not just that series, though... I'm rubbish at chaining on anything. That doesn't mean I didn't have at least a reasonable time... the sheer blasting potential means there's always some fun to be had in any game of this type. 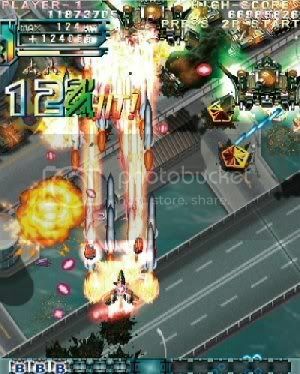 It's not a genre that's heavily catered for these days, so even though I knew it would kick my arse to Kingdom Come, I was determined to support Rising Star and buy DoDonPachi Resurrection as soon as it was released. As is their wont, Rising Star have managed to put together a Deluxe Edition. It's not as impressive as the Deathsmiles Deluxe Edition, but you do get a soundtrack CD in with the game. It's slightly disappointing that the Black Label and V1.51 editions are paid DLC, rather than being included on the disc, but they're only 800 and 80 points respectively, so you might as well fork out the extra (I did). So what of the game? 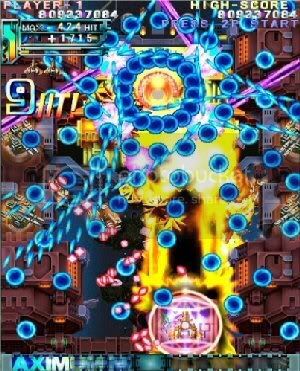 Well, it's a batshit-crazy vertically-scrolling arcade shoot 'em up. The fifth in a legendary series, the storyline sees you transported back in time to 2008, to where (when?) some unknown entity is sending vast quantities of material and data through portals which are spreading like a virus and threatening our very existence! Or something like that. It really doesn't matter that much what the story is, it's just a thinly veiled excuse to put you in a spaceship and give you the opportunity to destroy many, many alien enemies. And this, you will do. You're given a choice of three ships, each equipped with massive firepower. You have a standard, wide-ranging shot, and a more focused, concentrated laser. These can be switched between at will... simply holding down the fire button activates the laser. You also have a supply of bombs, which you can deploy yourself or which can be triggered by an enemy bullet as a last-ditch defence mechanism. Looks like someone's chucked a bag of liquorice allsorts at me. And then there's the Hyper. This is a special, massively powered-up version of your standard shot or laser, but you can only use it once it's been fully charged. It's worth the wait, though... not only is it more damaging, it also cancels enemy bullets and counts as hits to your hit counter, meaning you can quickly rack up a large chain, boosting your score tremendously. It's very rewarding to see your counter rocketing upwards. 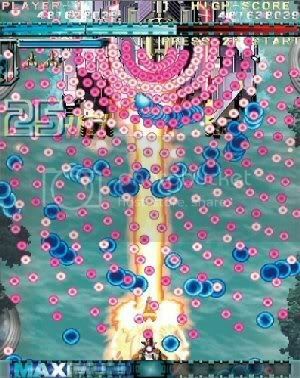 It's also pretty difficult to keep it that way... at first, DoDonPachi Resurrection is a bit like a standard shmup, but then the madness kicks in and the screen starts to fill with bullets and projectiles. I'm not kidding... weaving in and out of the mass of blue and pink takes a steady hand, a sharp eye and not a small amount of luck, if you're anything like me! I won't lie... I'm not great at these games. But the masochist in me still enjoys playing them. I've been playing this sort of game since the days of 1942, and because I'm quite good at the old-school games, I feel as though I shouldn't let the new breed beat me. It's a faint hope, but I do enjoy trying. Sadly, after a week or so, I was ranked at number 81 in the World on the Normal version of the game. That means that hardly anybody has bought it so far, which is terribly disappointing, if that's correct. Rising Star Games need our support, so that they'll keep bringing these games over here. Nobody else will do it, and they deserve our attention. They're not for everyone, but they're for more than have (apparently) bought it so far. If you fancy a real challenge, and something a bit different from Generic FPS #337, and you've got some money burning a hole in your pocket, be a devil... buy DoDonPachi Resurrection. I love it. Images courtesy of the Rising Star Games website.